Patriot Gold Corp., a developing gold and silver production and exploration company, announced the expected filing of an amended Preliminary Economic Assessment ("PEA") for the Moss Mine Project, dated June 18, 2013. 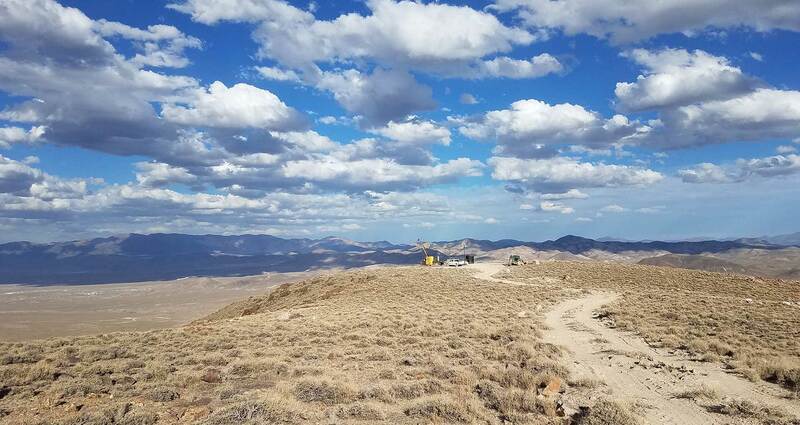 "We are excited about the completion of the amended filing and the progress this indicates for the Moss Mine project," said Bob Coale, CEO of Patriot Gold. "We are committed to implementing the recommendations of the amended PEA and working toward establishing a pilot operation to test the technical and economic assumptions of this report. We look forward to continuing to update our shareholders our progress on this exciting project." Augmented information about the rationale for the channel-shaped "trench" open pit model for the near-surface Moss vein stock-work system versus using underground mining methods to mine the deposit. Additional description of the geology of the Moss vein stock-work mineralized system to further assist the reader in assessing the open pit mining model used in the report versus using underground mining methods. Further disclosure about the prior underground mining and its minimal effect on the estimated resource base. 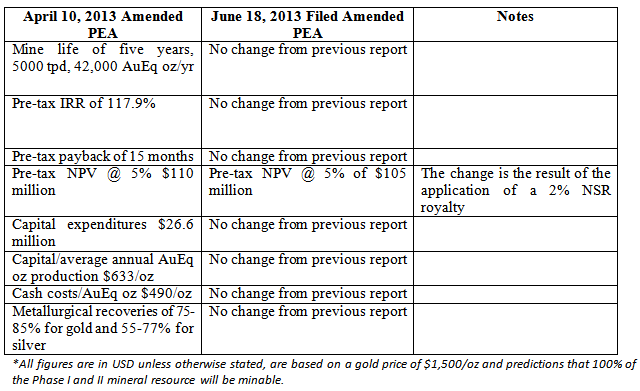 Additional information about the choice of a 0.3 grams/tonne cut-off for the resource estimates included in the PEA. Additional explanation of the oxide/non-oxide nature of the deposit and the influence of that on metallurgical recoveries. Further explanations of the extensive surface, and subsurface, geotechnical work carried out on the Moss Mine rock structures. Effects of the approximately 2% NSR royalty on the Moss Mine Gold-Silver Project economics. Additional sensitivity analysis to show the effect of percentage changes in metals prices, capital costs and operating costs on the project's base case economics. Inclusion of updated consensus price forecasts information as part of the $1500/ounce gold and $30/ounce silver price assumptions. Information about the tax structure in the jurisdiction in which mining would take place and recognition that while tax effects are not quantified they will reduce project net present value and internal rate of return. Revised recommendation to increase drilling (and related assaying and reporting) from 2200 to 3700 meters at an approximate additional cost of $442,000 ($904,000 total cost of drilling). The PEA conclusions are not dependent on the outcome of the drilling which is designed with the goal of upgrading resources lying outside of the first two phases of the project. The Company reiterates that the Amended PEA is preliminary in nature and that there is no certainty that the preliminary economic assessment will be realized.